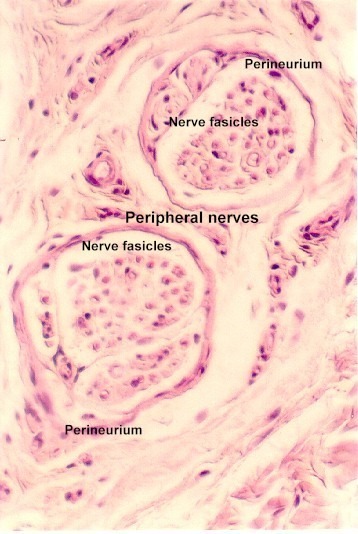 Peripheral Nerve Histology | Microanatomy Web Atlas | Gwen V. Childs, Ph.D.
A section through peripheral nerve is shown. 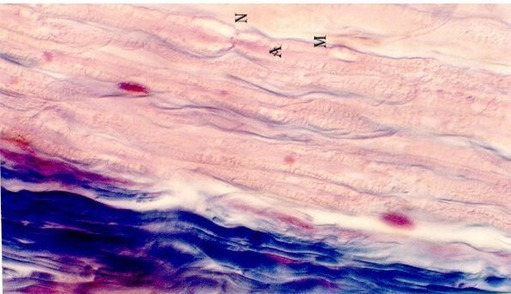 The differential staining shows the different layers Blue stain indicates connective tissue. 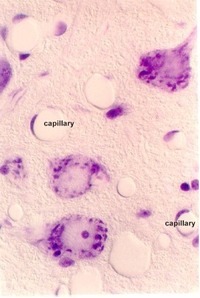 Outside the nerve, loose connective tissue with adipose cells is called epineurium. 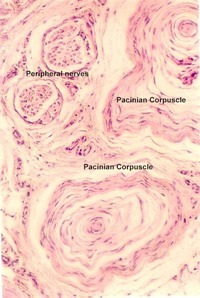 The next layer of connective tissue which is denser and ensheaths different bundles of nerve fibers is called perineurium (shown dense blue in the slide). 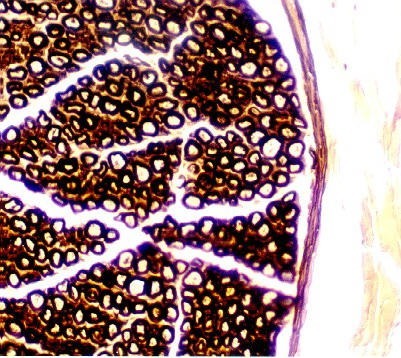 Delicate connective tissue surrounds each nerve fiber; this is called endoneurium. In the photo and slide 3, you can see endoneurium around each fiber as delicate blue fibers. A=Axon, M=myelin sheath. N=Node of Ranvier). Find the same structures on the following higher magnification of peripheral nerves. The following is a section through a peripheral nerve stained with Osmium tetroxide to bring out the myelin. The myelin sheath is stained because of the abundance of lipids in the membranes wrapping around the axon. Each myelinated axon looks like a donut. You can also see adipose cells well in this section. They contain stained, preserved fat droplets that stain dark brown-black. 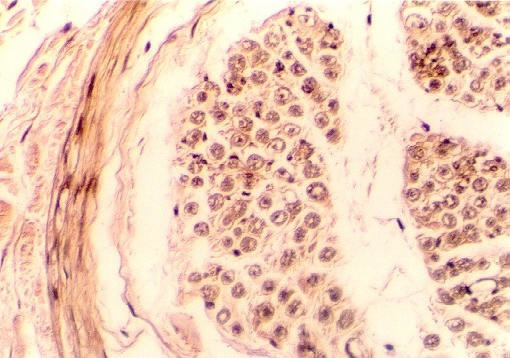 A peripheral nerve stained with Verhoeff's van Giesson stain. It shows nerve bundles called fasicles, epineurium, perineurium, endoneurium, axons and myelin. Practice your skills: find each of these structures and label the following figure. A section of skin is a good place to find examples of peripheral nerves in the connective tissue. Learn to recognize these in connective tissue.